How to create and run script procedure in devices? 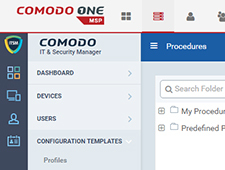 Comodo python procedures are available in ‘Predefined Procedures’ Folder. Additionally, ITSM User can create custom python procedure and run the same over enrolled devices. Step 2: Go to “View Procedure” tab and Click the ‘Edit’ icon. Step 3. Review and Approve the procedure by Clicking Ready to Review and Approve icon one after another. Step 4: To run the procedure over “Selected Devices” or “All devices”, follow the steps below. C) Choose “All devices” to run the procedure over all devices or Choose Selected Devices to execute the procedure over selected devices. D) Select “Run as system user’ to run the procedure as ITSM user (Administrator privilege) or Select ‘Run as logged in user’ to run the procedure as logged in user from the local machine. E) Click ‘Run’ button to apply the procedure for the devices. F) To Check procedure logs, follow the below steps. D) Once the popup form presents, Type and Choose required procedure from the search box. E) Select “Run as system user’ to run the procedure as ITSM user (Complete privilege) or Select ‘Run as logged in user’ to run the procedure as logged in user of the local machine. F) Click ‘Run’ to apply the procedure over devices. Technicians can schedule script procedures in profiles and apply it on desired devices. Step 2: If “Procedure” tab not available in profile follow the step otherwise go to Step 3. Step 3: Click “Add” button from “Procedures” tab. A popup screen will appear to add existing script procedure. 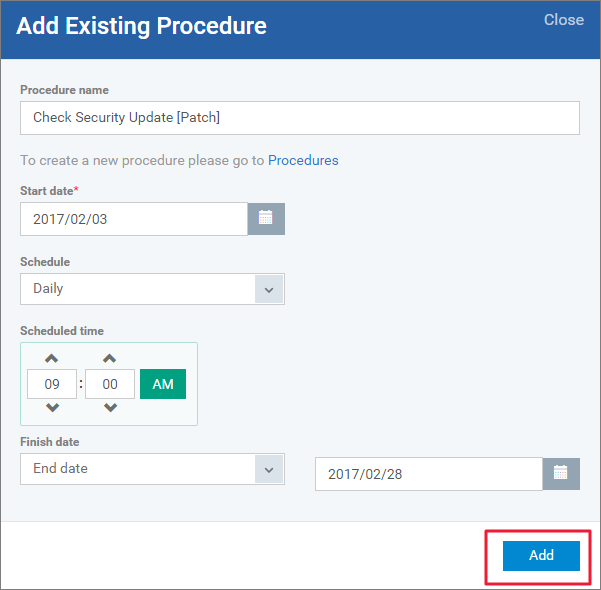 A) Choose the script procedure from the search box Procedure Name, select the date from the Start Date field, select the value from Schedule drop-down, Select the time from the Scheduled Time and Select ‘End Date’ from Finish Date and Choose the date from the field next to Finish Date. B) Select “Run as system user’ to run the procedure as ITSM User (Administrator Privilege) or Select ‘Run as logged in user’ to run the procedure as Logged in User of the local machine. Step 5: Click ‘Add’ button to successfully complete schedule of the procedure. 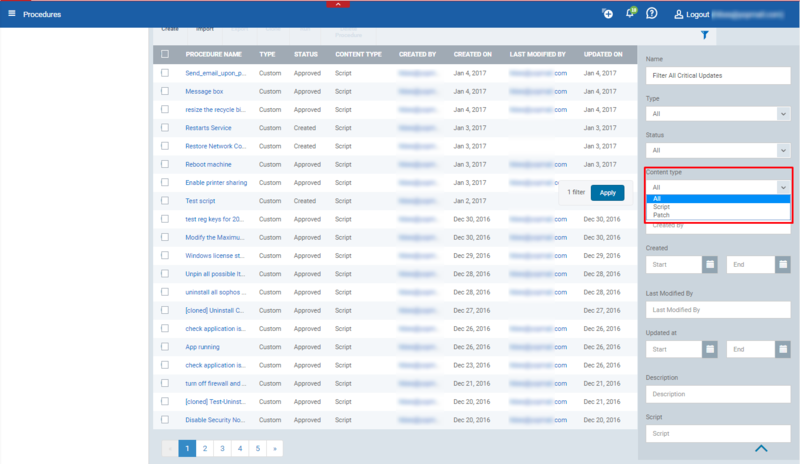 Once the steps are completed, the scheduled procedure will be run automatically on devices where the profile is applied. 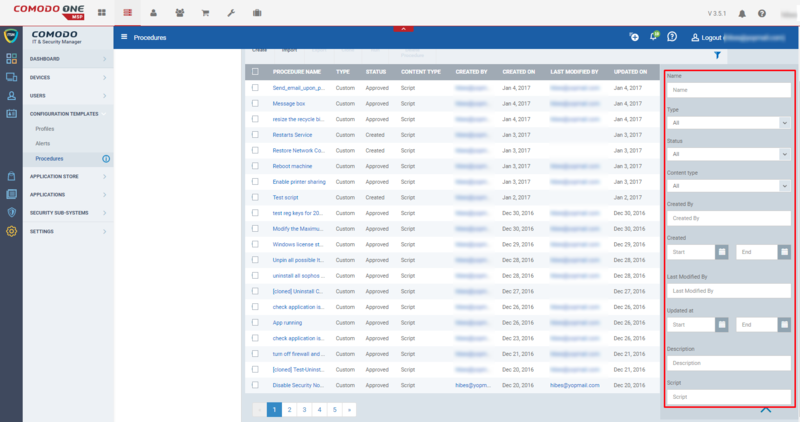 How to use script categories and keep them organized? 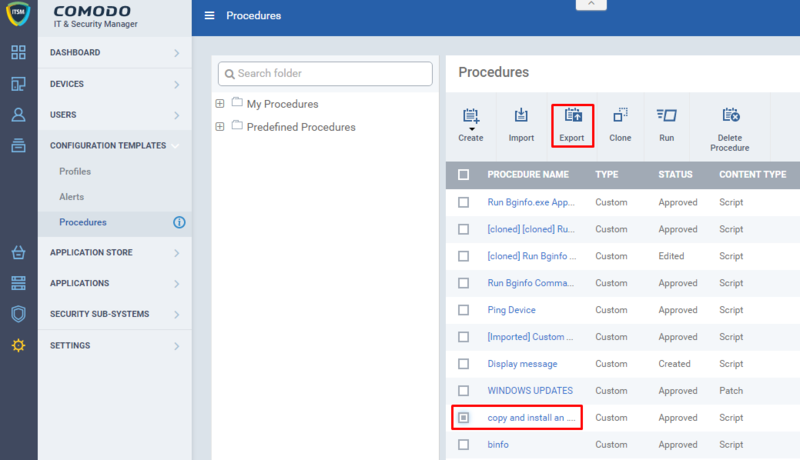 Step 1: Go to ITSM -> Configuration Templates and then click “Procedures” menu. 1. My Procedures folder – The Custom patch Procedures or Custom script procedure can be saved in this folder. 2. 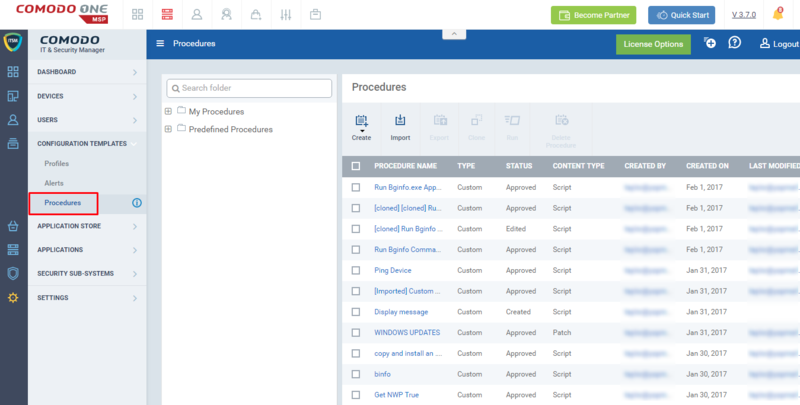 Predefined Procedures folder – Built-in patch procedure or script procedures were stored in this folder. Step 3: Click Expand Icon to View the Sub-folders. Step 4: A User can add, delete, edit the sub-folder in “My Procedure folder”. 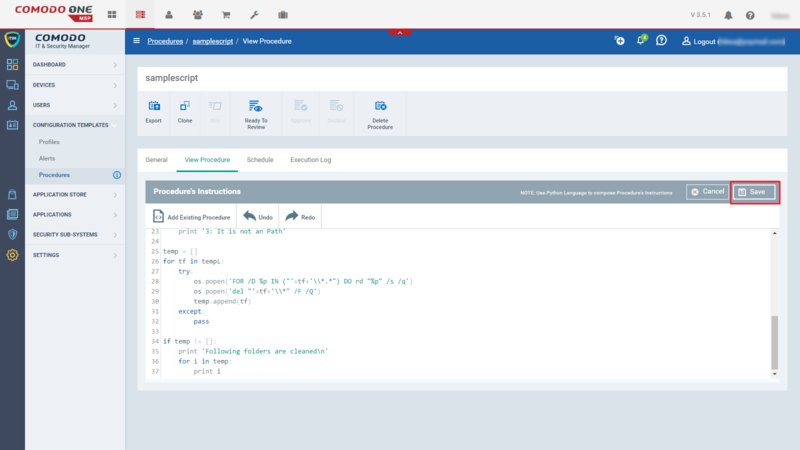 Note: The User cannot the edit the predefined procedures and its sub-folder, but he can clone the procedure. Step 5: To add a sub-folder to “My Procedure folder”, click the Add button. 1. Give a name for sub-folder and then click the add button. Example: Log Script is added as a sub-folder for My Procedures. Step 6: Click Edit icon to rename the sub-folder. Step 7: Click delete icon to remove the sub-folder. Step 8: Click the folder name to view the saved procedures. 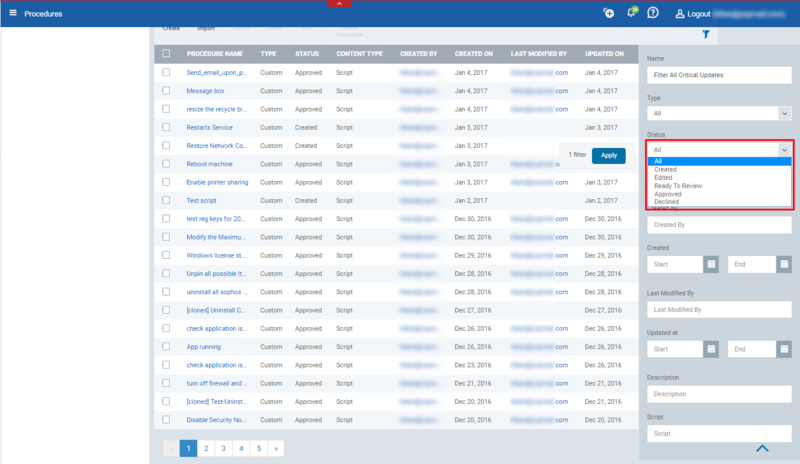 Example: Click ” Ready for Review” Folder, the procedures which are be reviewed will be saved here. 1. [*=1]Click create procedure button and fill the form by providing a name and a description. In the folder drop-down, choose the category folder to which the user want to add the procedure. Description: Service that has been stopped can be restarted. 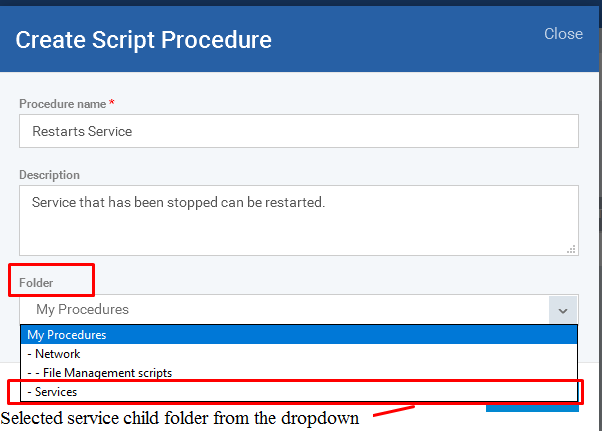 Folder: To add the procedure to Service Child folder, select services from the drop down. 1. Change the folder by clicking the drop down. 2. Choose the appropriate folder and save. 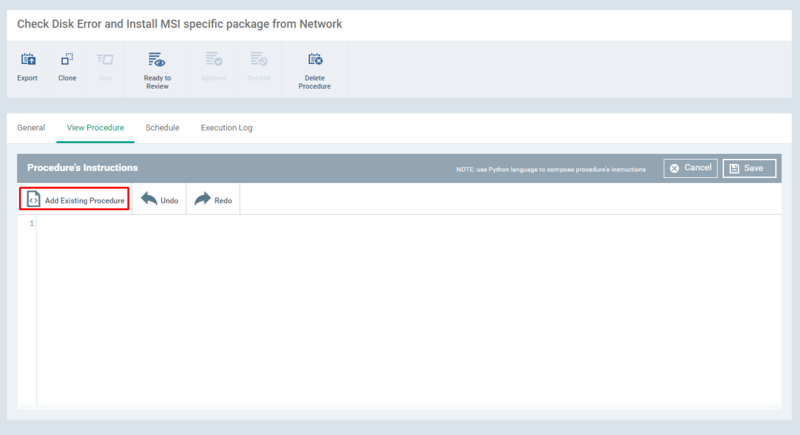 Example: “Network” child folder is being chosen from the drop down. 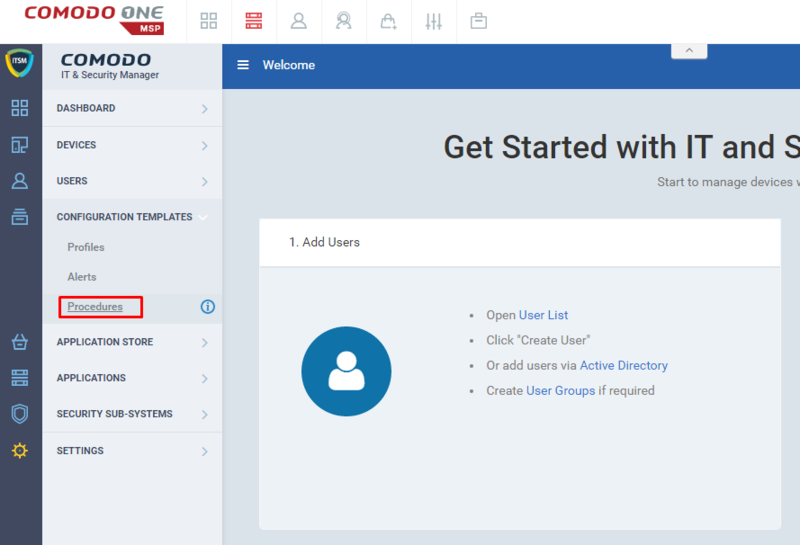 Step 1: Go to ITSM -> “Configuration Templates” menu and select “Procedures”. Step 2: Click on the “Create” icon and click “Create Patch Procedure”. Step 3: Click ”Add Profile Section” icon and select “Procedures” from the drop-down. 1. 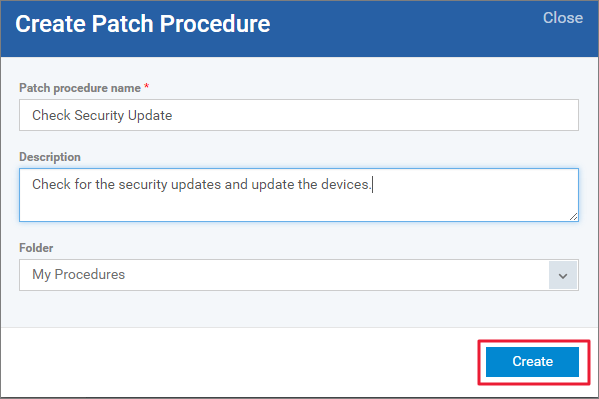 Patch procedure name – Enter the patch procedure name. 2. Description – Enter the description. 3. 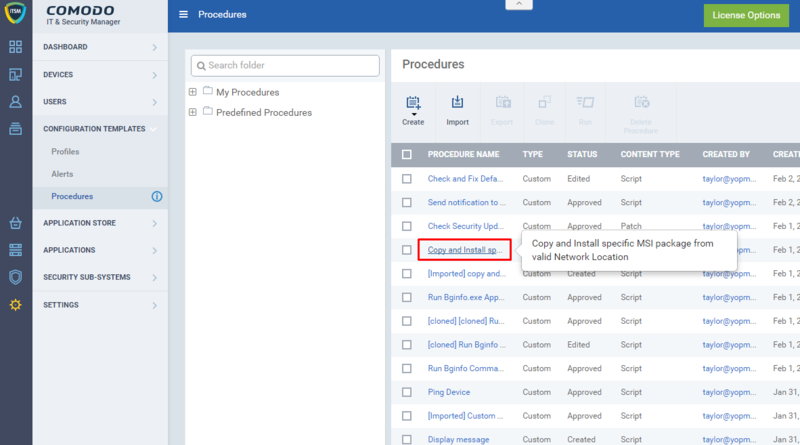 Folder – Select the folder to added the procedure under that folder. 1. 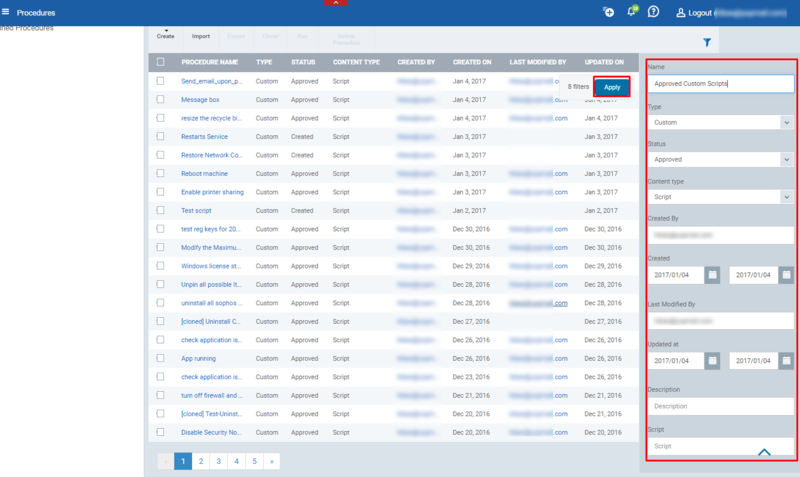 General section – Modify Name, Description and folder and define the alert setting. 2. Exception options – Select your desired update option for your procedure from “choose the Microsoft software update”. i. “Force the reboot in” – The reboot operation will be applied to the device at the mentioned time without user’s permission. Example – 5 minutes. ii. “Suppress the reboot” – The reboot operation will be suppressed. iii. “Warn about the reboot and let users postpone it” – The warning message will be sent to user’s device and the reboot operation will be performed by his desire. Set the reboot options as per required. 5. Execution Log – The result of the procedure output are displayed in this section. 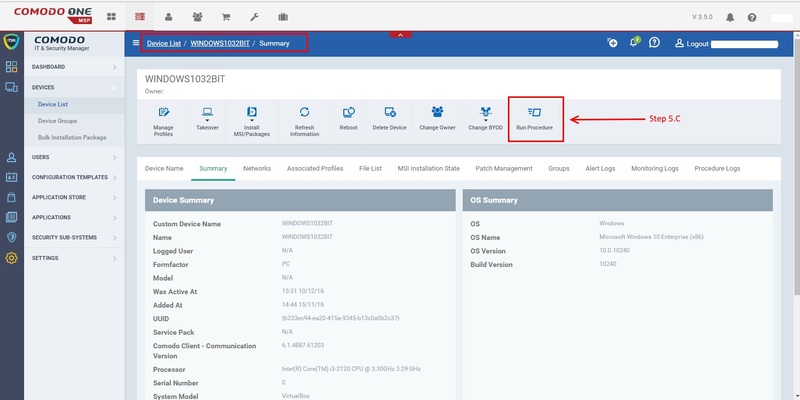 Step 1: Go to “Configuration Templates” and select “Procedures” menu. Step 2: Select the checkbox of the patch procedure for which you want to apply to the device and click “Run” button. Step 3: A ‘Run Procedure’ dialog box appears, choose appropriate options and click “Run” button. i) All Devices -The procedure will be applied to all enrolled devices. ii) Selected Devices – To add a device, enter the name of the device in which you want to apply the procedures. To remove the added devices click the x mark of the system. iii) Run as system user – The procedure will run as System user. 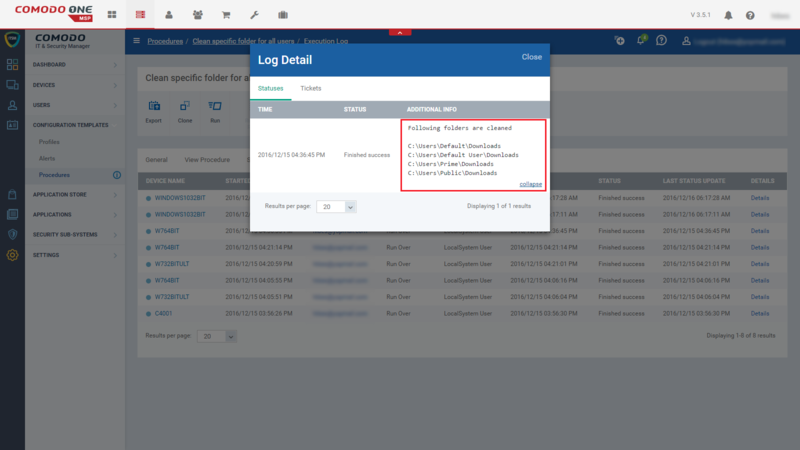 iv) Run as logged in user – The Procedure will run as Logged in user. Step 4: The patch procedure will be sent and executed in that devices. 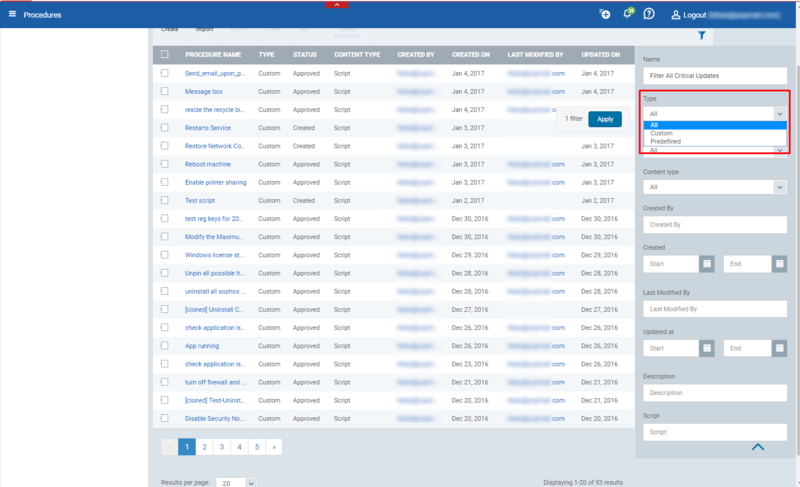 Go to “Execution Log” tab and click “Details” link to view the result. Step 1: Go to “Devices” and select the “Device List” menu. Step 2: Select the device, in which you want to run the patch procedure. 1.Click the “Run Procedure” button, “Run Procedure” dialog box appears. 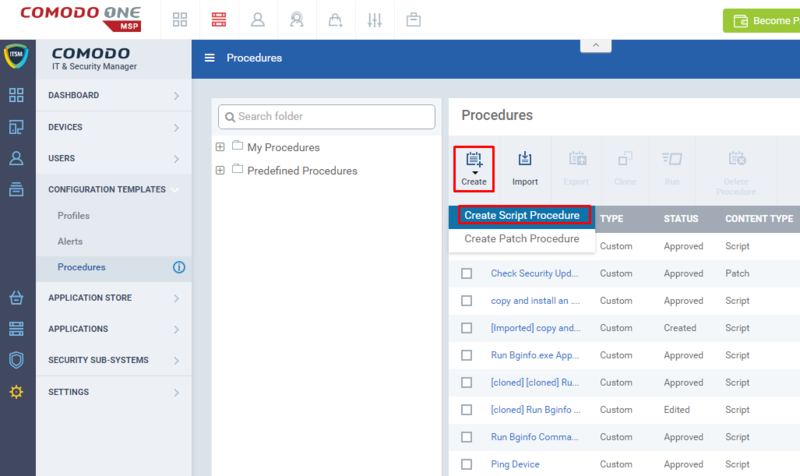 2.Type the patch procedure name in the text field and choose the procedure. 3.Choose either “Run as system user” or “Run as logged in user” based on the rights and Click “Run” button. Step 4: The procedure will be sent to that device and executed. A patch procedure can be scheduled to run on the devices using profiles. Thus the patch procedure run on the devices under that profile at the mentioned time. It saves the time of the user. Step 1: Go to ‘Configuration Templates’ -> ‘Profiles’. Step 2: Select the profile to which you want to add the profiles from the list. Step 3: Click “Add Profile Section Icon” and Select “Procedures” from the drop-down. 1. 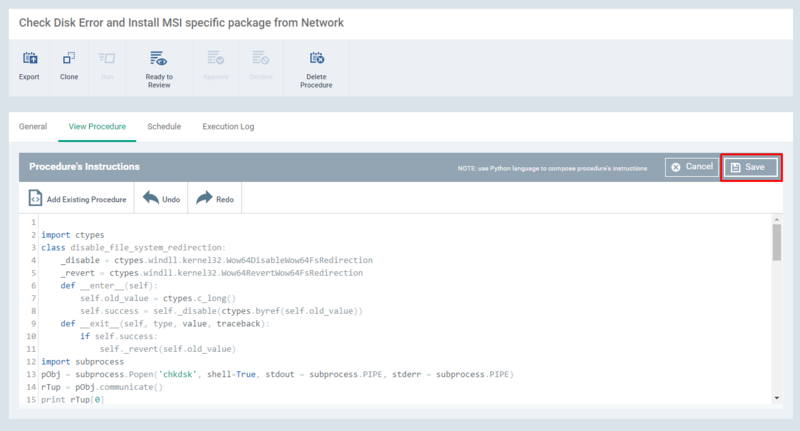 Procedure name – Type the name of the patch procedure that you want to add to the profile. 2. Start Date – Give the start date of the schedule. 3. Schedule – Define the schedule frequency. 4. Scheduled Time – Set a time at which the procedure need to be run. 6. 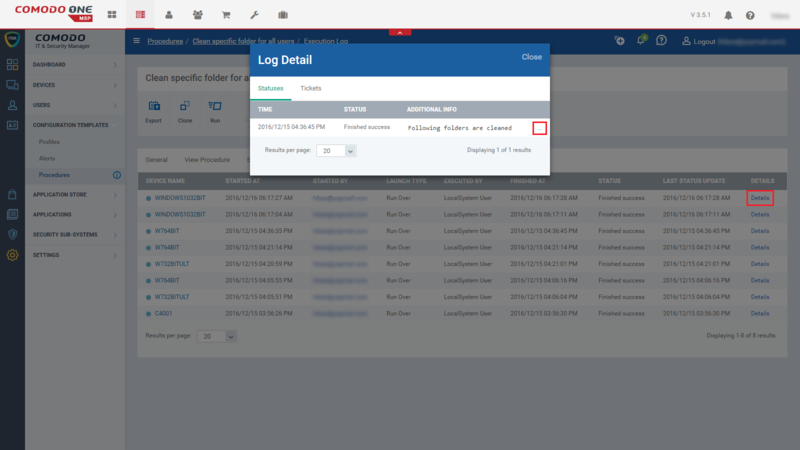 Run as logged in user – The Procedure will run as Logged in user and click the “Add” button. Step 5: Click Save button in the “Procedures” tab. The procedure will be added to the profiles then the patch procedure will execute in the devices as scheduled. 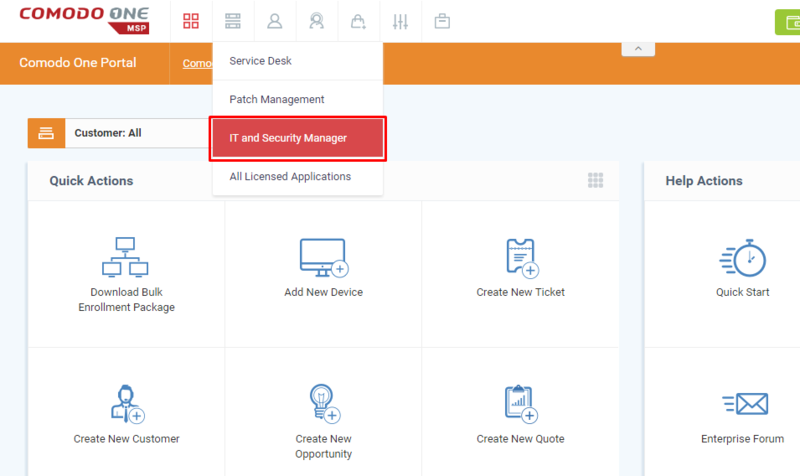 In ITSM alert can be configured for scheduled procedures in profiles. Alert will be triggered when procedure fails to execute as expected. Step 1: Go to ITSM -> “Configuration Templates” and click “Procedures”. 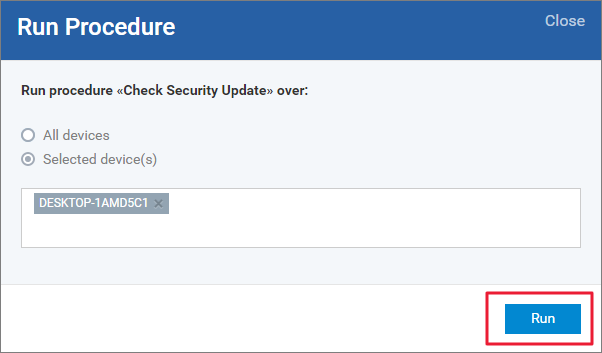 Step 2: Click existing patch procedure name to which you want to add the alert settings from the list. Example: “Windows Update” patch procedure. Step 3: Go to “General” tab and click “Edit” button. Note: Only the existing alerts can be added to the procedure. Step 5: The changes will be applied to the procedure. Thus the user will receive the alert based on the alert setting, if a patch procedure fails. Procedures can be exported from ITSM application to a local computer. Similarly, a procedure can be imported from the local computer to ITSM application hence the both way helps the user to easily create a procedure on ITSM. 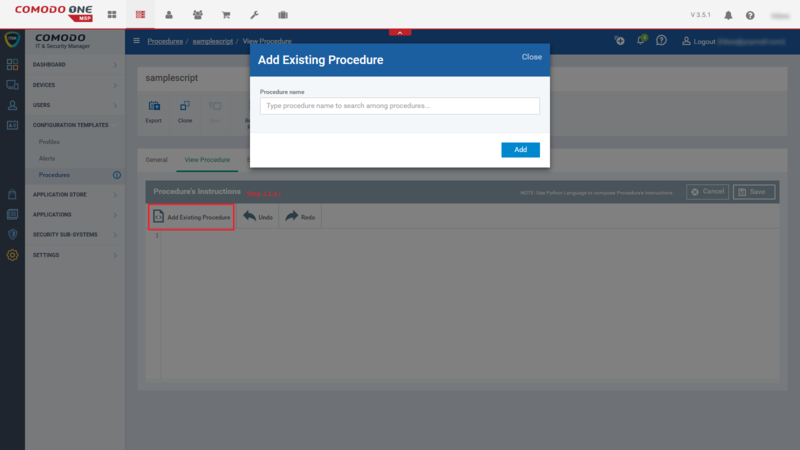 Also as ITSM user, you can clone a procedure from a procedure that already exists in the ITSM so that user can use the existing procedure so quickly and easily. Step 1: Launch ITSM and go to ‘CONFIGURATION TEMPLATES’ -> ‘Procedures’. Step 3: Click the ‘Save’ button with choosing of the respective location. 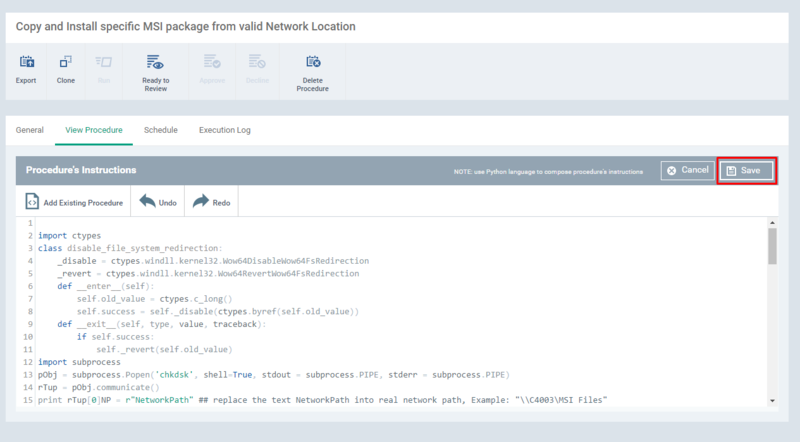 Step 4: A JSON file will be saved in the location you have chosen. Step 2: Click the “Import” icon. 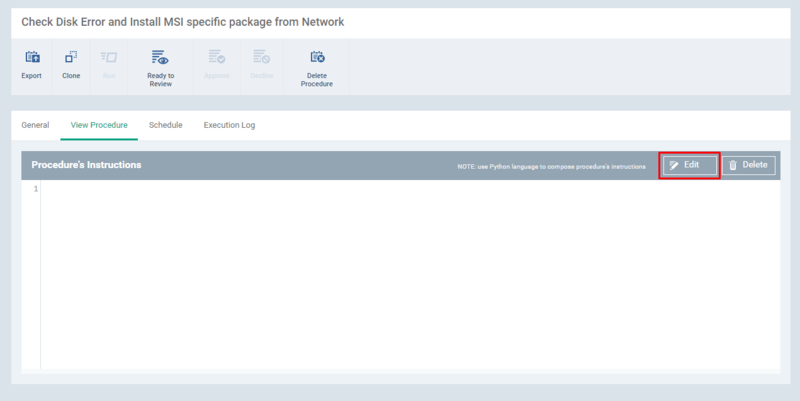 Step 3: Click the ‘Browse’ button from the ‘Import Procedure’ popup window. 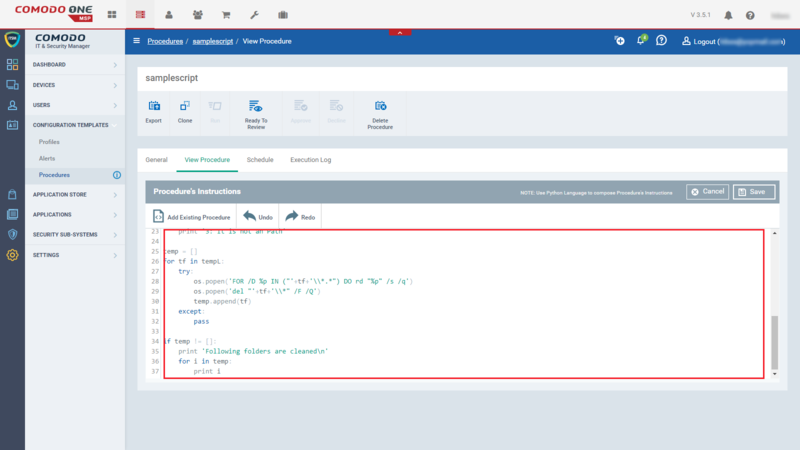 Step 4: Select a Script file (JSON) from the local computer and click the button “Open”. 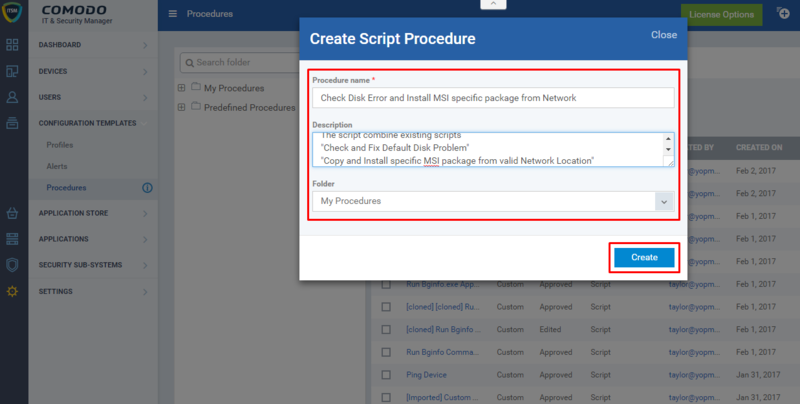 Step 6: Check the ‘Procedures’ List Table whether you have the Script file on the top of the list. Step 2: Choose any procedure from the ‘Procedures’ Table List and click ‘Clone’ icon. Step 3: Fill the ‘Clone Procedure’ form then click the button “Clone”. You can change the name of the procedure, description, and folder while cloning a procedure otherwise keep the default values on the fields. Step 4: Check the ‘Procedures’ List Table whether you have the Script on the top of the List. Step 2: Go to ‘CONFIGURATION TEMPLATES’ -> ‘Procedures’. Here is the two cases are available such as combining with selecting Existing Procedure and combining with new procedure. If the user selects existing procedure then the steps below are followed. Condition: Clone the existing procedure that you want to select is a safe idea suppose if you have any exception on combination. Step 3: Select Existing Procedure from the table. 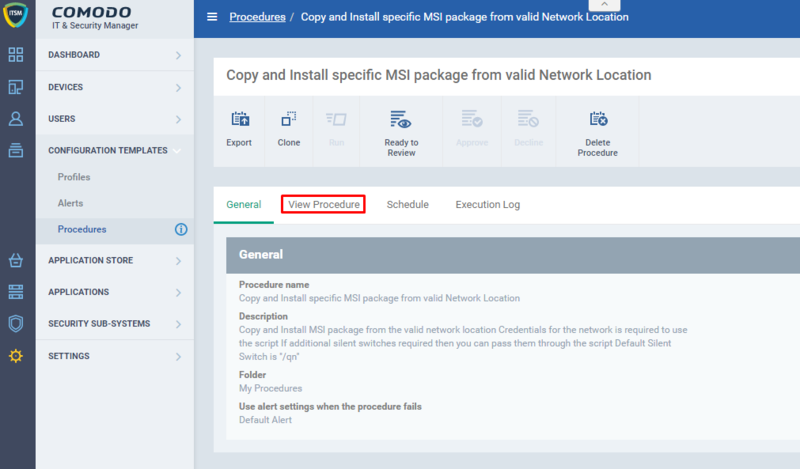 Example: Copy and Install specific MSI package from valid Network Location. Step 4: Click ‘View Procedure’ tab. Step 5: Click ‘Edit’ button. Step 6: Click ‘Add Existing Procedure’. Step 7: Type the specific Procedure Name you want to combine with the Procedure. Step 8: Select the script from the drop down and click the ‘Add’ button. Repeat the steps 6, 7 and 8 if you would like to add more scripts here. As per the example scenario, you have the code for both the procedure now. Step 9: Click ‘Save’ button to update the script and Run the script to get the desired outcome. If the user create new procedure to combine the existing procedures then follow the steps below. Example Scenario: As a user, I would like to combine the scripts “Check and Fix Default Disk Problem” and “Copy and Install specific MSI package from valid Network Location” in a new procedure. Step 11: Fill the fields from the pop-up forms such as Name, Description, and Folder and click ‘Create’ button. Step 12: Click ‘View Procedure’ tab. Step 13: Click ‘Edit’ button. Step 14: Click ‘Add Existing Procedure’ from the Editor. Step 15: Select the Script you want to add here and click ‘Add’ button. Repeat the steps 14 and 15 if you would like to add more scripts here. Step 16: Click ‘Save’ button to save the script and Run the script to get the desired outcome.